Each year, Kenya commemorates World Wetlands Day to mark the adoption of the Ramsar Convention on Wetlands in Iran like the rest of the World. The convention came in force in Kenya in 1990. Hitherto, the country has been celebrating the event annually on 2nd February. The convention aims at promotion of conservation and sustainable utilisation of wetlands. In Kenya, wetlands occupy approximately three to four percent of the Kenya’s landmass. Each year, Kenya commemorates World Wetlands Day to mark the adoption of the Ramsar Convention on Wetlands in Iran like the rest of the World. The convention came in force in Kenya in 1990. Hitherto, the country has been celebrating the event annually on 2nd February. The convention aims at promotion of conservation and sustainable utilisation of wetlands. In Kenya, wetlands occupy approximately three to four percent of the Kenya’s landmass. This year, Kenya held its national celebrations at Ewaso Narok Wetland at Rumuruti, Laikipia County. The chosen theme was “Wetlands and Climate Change”, the Kenyans domesticated slogan was “Healthy wetlands, Healthy Communities.” The theme aimed to highlight the critical role of wetlands in mitigation and adaption to climate change. Ewaso Narok wetland is the largest wetland in Laikipia covering 23 kilometre squared, rich in biodiversity of 172 birds and over 100 plant species. The chief guest was Environment and Forestry Cabinet Secretary Hon. Keriako Tobiko. Speaking during the event, Mr. Keriako called on leaders to support the conservation agenda of the government and avoid politicising government efforts to save forests and wetlands in the country. Mr. Keriako called on the locals to take care of the environment and specifically water sources not only for their benefits but also for others. 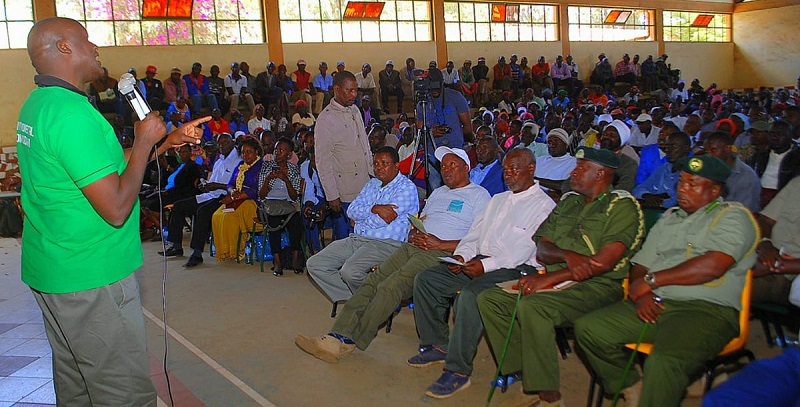 Mr. Keriako urged locals to focus on development and shun away from leaders politicking at the expense of development. The event was also graced by Laikipia Governor, H.E Ndiritu Muriithi, his Deputy Governor John Mwaniki, Laikipia West MP, Patrick Mariru, Laikipia North MP, Sarah Korere and Laikipia County Executive Committee Members. Laikipia Governor, H.E Ndiritu Muriithi underscored the need to protect Ewaso Narok wetland as it forms the livelihoods not only of people of Laikipia but people downstream. Ewaso Narok wetland is a critical Section in the magement of Ewaso Nyiro basin with its source in the slopes of the Aberdares and Mount Kenya. NEMA was represented by the board of management led by Chairman, Mr. John Konchelllah, board members, Director General, Prof. Geoffrey Wahungu and members of staff. NEMA Chairman, Mr. John Konchellah noted that wetlands are vital resources and the Authority has been working to conserve the wetlands all over the country. This involves facilitating the enactment of draft Wetlands Regulations. The Authority has also initiated mapping and gazetement of various wetlands in the country to enhance the conservation efforts. “NEMA will work to strengthen governance structures for wetlands and climate change to promote sustainable use of wetlands from local to national levels,” Mr. Konchellah stated. Speaking during the celebrations, NEMA Director General, Prof Geoffrey Wahungu informed the public that wetlands and other water bodies should be taken care of to benefit all people. “Ewaso Narok wetland does not only benefit the people of Rumuruti, it also forms the livelihood of people upstream and downstream, hence we need to conserve and consider others,” Prof. Wahungu stated. The government has published a notice of intent to declare Ewaso Narok Swamp in Laikipia County as a protected area pursuant to Section 42 of EMCA 1999 that mandates the CS for Environment and Forestry on recommendation from NEMA to impose such orders and restrictions on a wetland. This follows the ongoing efforts to rehabilitate the wetland that has been going through extensive pollution, over grazing, soil erosion, siltation and abstraction of water for irrigation. The wetlands celebrations were also held in the rest of the 46 Counties led by NEMA’s County officials. 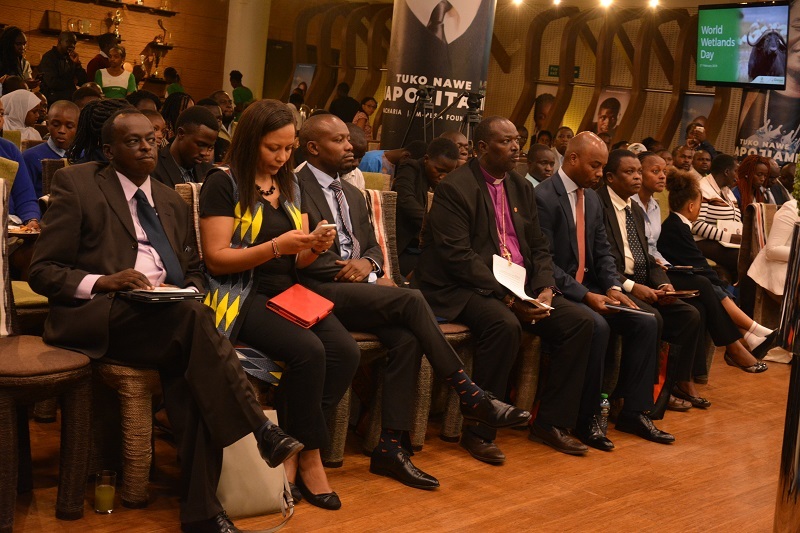 NEMA partnered with Safaricom to host a successful World Wetlands Panel discussion at Safaricom Michael Joseph Centre on 30th January 2019. Safaricom is one of the leaders in promotion of sustainability. There was a Community forum at Rumuruti Catholic church on 1st February 2019. Over 300 local residents gathered to raise their views on the value of Ewaso Narok wetland and benefits they accrue from it. The community forum was graced by government officials and experts on environmental management and specifically wetlands. The forum was organized by NEMA, County Government of Laikipia, Netfund, Ministry of Environment and Forestry among other partners.